Priestesses Caroline Wise and Carrie Kirkpatrick are running a workshop called Hecate's Wheel - A Workshop of Magic and Transformation in London on Saturday, November 25. Facilitated by Goddess Enchantment Workshops and Training, the event runs from 10.30am to 6.30pm. It costs £55, which includes light refreshments and all you need to make wonderful things. Known as the Goddess of the Crossroads, the Goddess of the moon and the earth, of weathering storms and lighting the way, Hecate is the mistress of magic, spells and protection. She was venerated as a Goddess, appealing to the people of Ancient Greece and beyond. Her popularity has not waned over the centuries. Today she remains one of the most popular Goddesses in the Neo-pagan and Goddess Movement and she is accessible both as a guide and teacher in all things magical. She is the ‘Granter of Wishes’, and offerings referred to as ‘Hecate’s Suppers’ were made to Hecate at the Crossroads. People would petition her and ask for their wishes to be granted. As torch bearing goddess of doorways, she can inspire new projects and new directions in life. As key holder, she can aid in the opening the ways forward, and revealing what is hidden or hampering your progress. At the workshop you can learn about Hecate’s many aspects, her totem animals, her plants and symbols. As well as exploring how these can be relevant and useful to you in your life and work, those attending the event will create magical talismans from clay to take home. "How do we find her in this land? As above and so below, during the day we will draw in Hecate’s lunar manifestations, and those of the deep earth, as guides for you on your path today." Caroline Wise has been a priestess of the Goddess for 30 years. She has contributed to several books on the Goddess, and has a special interest in those of the old tracks and crossroads. She has worked in Spiritualism, and for many years taught a weekly class on Goddess studies and priestess training. She presents regular goddess days and in the 1990s produced conferences in London on the Goddess, and the Wildwood conferences concerning the cross-over between folklore and modern paganism. Her own Hecate initiation came during the Great Storm of 1987. Caroline is the co-editer of The Secret Lore of London, the compiler of the book Finding Elen, the Quest for Elen of the Ways and a contributor to Every Day Magic - A Pagan Book of Days. She presents talks, ceremony and teaching workshops in the UK, Germany, Italy and the USA. Carrie Kirkpatrick has been a priestess of the Goddess for 20 years and is dedicated to the Goddess Hecate. She has facilitated Goddess Enchantment workshops with Kleo Kay for several years and is the author of Goddess Enchantment – Magic and Spells Vols. 1 (pictured above right) and 2 and the Goddess Enchantment Oracle App. As a psychic, she has appeared extensively in the press and on TV and brought her teachings on how to connect to the Goddess energies to these platforms. 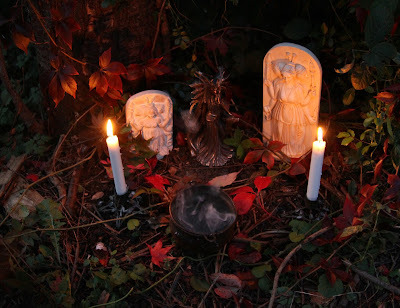 Also a filmmaker for many years, Carrie directed and produced the film ‘Hecate Rising’ in 2006, a documentary of an outdoor public interactive ritual dedicated to Hecate and celebrating Samhain. Carrie has also produced and led many open rituals for the Pagan Federation over a period of 15 years.